Despina Katsikakis, Passionate about transforming workplaces to inspire, motivate and make your business the place to be. Corporations are changing to be more agile and reliant on dispersed talent networks and open source innovation. This contradicts the design of the workplace which evolved to support the uninterrupted flow of paper processing, with a focus on efficiency and visual supervision. As connectivity and access to knowledge become the defining features of business and society, we have become confused about the purpose of the office. It is well proven that traditional work environments of rows of desks are obsolete to facilitate new connections and knowledge sharing. We therefore need to shift the focus of the workplace from efficiency to engagement, to redefine how and where work is accomplished and explore ways that the workplace can inspire and enable people to do their best work. We now have four generations at work and whilst they have varying priorities, they are all aligned on their expectations of: choice and flexibility, greater transparency, more teamwork and more amenities to support authentic sociability, knowledge, convenience and wellbeing. The business environment of the future needs to support: choice and flexibility, facilitate people to connect with complementary skills across a network, complex relationships to flourish, to work together on challenges, to learn fast, unlock their passion, improve performance and react quickly to new business priorities. Technology now enables us to work anywhere and the arguments in favor of more flexible working practices are powerful and here to stay. Findings consistently suggest that workers gain better work life balance, are more productive, can concentrate better and experience reduced stress and commuting times. Flexible ways of working also enables office buildings to be used more intensively, as workspace can be used on a shared, as-needed basis. The value of the co working phenomenon has now been recognized worldwide. The defining characteristics of co-working spaces focus on creating community, on collaborative rather than individual working and a range of spaces to support innovation. These ‘third-space’ workplaces vary in terms of scale, variety of settings and even where they lie on the leisure-work continuum. They share certain layout characteristics, including: zones dedicated to concentrated working, collaboration, touchdown for short duration visits, formal and informal meeting rooms, café and social spaces, business and tech support spaces, but most significantly curation of events to support community of interests and knowledge sharing. 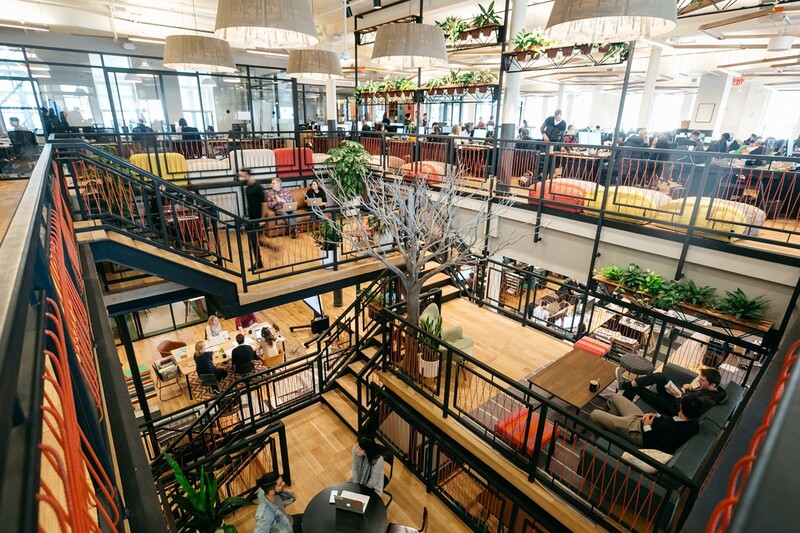 Corporations are starting to embrace the use of co working spaces both in city centers and close to where people live to cut down commute times. These co working spaces, become neighborhood services, that can improve the work life balance of millions of people but also improve local communities and the growth of local economies. In addition, the corporate users benefit from access to innovative talent through the co working ecosystem and from ‘spaceless growth’ — maximizing flexibility while minimizing fixed costs. These new working models are changing the workplace from a container of routine work into a hub for bringing colleagues together. The office begins to look and work more like a city. Fundamentally altering how space is used over time and redefining the boundaries between corporate, retail and hospitality uses. Drawing to the office valued urban experiences and spaces: quiet areas, individual experiences, courtyards, cafes and social destinations. The successful characteristics of cities become part of the design language; permeability, diversity, overlapping experiences that surprise, delight and constantly change. Space no longer reflects hierarchical structures but supports dispersed networks and open source innovation. It is used more intermittently and intensively, designed with meaning, focused on values, culture and community. The nature of the city also changes as it becomes an extension of the office — a broad workscape in which key work functions move into coffee shops, co-working spaces and the public realm. The workplace becomes less of a static backdrop to routine solitary work, and much more a setting for a diverse mix of spaces, amenities and events to facilitate serendipity, community and knowledge. The focus shifts to be flexible and responsive, a hotel-style facility that provides a high level of service and experience to its demanding ‘guests’. This new blurring of boundaries of space, time and use has served to increase rather than relax the pressure on work settings to perform. The only constant is dynamic change. We can safely say that the office environment will no longer be made up of rows of desks but of a rich variety of settings and curated events which will blur the boundary between personal, shared and public spaces to support organisational innovation. This new, people focused approach, demands fresh thinking in the design, leasing and servicing of buildings and workplaces. • Space is used as a key medium for expressing corporate culture and values. • Design and leasing needs to support continuous adaptability and diverse use patterns. • Loose fit, activity-based settings for collaboration, creativity and contemplation. • Shared spaces, used as a means to facilitate collaboration and community. • Amenities and service provision to support work/life (food, wellbeing, learning, etc.). • Technology interfaces that are intuitive and seamless to improve user experience. • Events curated and managed to create memorable experiences and to attract talent. • Permeable to the public realm to reinforce a sense of community and connection. It is easy to see how real estate portfolios will increasingly become a dispersed network of social and adaptive working environments, empowering individuals and teams across different work contexts. Our own workplace will be a menu of co working environments that leverage our social networks and support our personal needs and aspirations day to day — hour by hour. By embracing the sociability of where work happens, we can enable people to connect with like-minded people at inspiring spaces and events — to collaborate and co-create value for themselves, their business and their community. An industry leader with an international reputation for thought leadership and innovation on the future of work and the impact of the workplace on organisational transformation and business performance. Established through long term client relationships and over 35 year experience of leading innovation, research and implementation of transformative business environments and exemplary real estate developments worldwide.